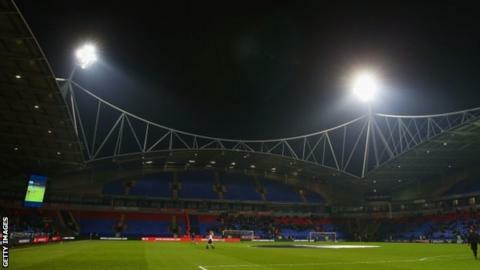 Financially troubled Championship side Bolton Wanderers have told staff they may not get paid this month. Around 300 staff based at Bolton's Macron Stadium and their two training grounds were informed of the situation on Wednesday morning. A failure to sell players or car park land have caused the funding problem. On Monday, Bolton were given until 22 February to resolve issues that led to Her Majesty's Revenue and Customs bringing a winding-up petition. At the time, it had been anticipated the club would be able to pay its salaries. But the proposed transfers of midfielders Mark Davies to Sheffield Wednesday and Zach Clough to Bristol City had already fallen through and the sale of car park space close to the stadium has not gone through quickly enough to generate capital, leading to the latest development. Bolton, who are bottom of the Championship, did earn £67,500 in prize money on Tuesday by beating non-league Eastleigh to earn an FA Cup fourth-round tie with Leeds, but those funds are insufficient to cover the liability. As the club is operating on a day-to-day basis, the situation could change very quickly, which would allow the wages to be paid. Bolton's players were not paid on time in November but this is the first time other staff have not been paid. Facing the possibility of relegation to League One, Bolton are £172.9m in debt and under a transfer embargo for breaching Financial Fair Play rules. They owe HMRC £2.2m. Interim chief executive Trevor Birch has been negotiating with potential buyers after owner Eddie Davies said he was willing to write off the debts but was not prepared to put any further money into the club.